Your Rehab Specialists - We Make You Move! Abet Medical is a family owned and operated company serving the tri-state area (PA, NJ, DE) since 1987. 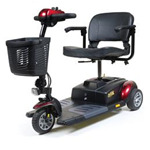 Abet Medical specializes in complex customized wheelchairs and custom mobility solutions for adults and children. We accept most insurances. Please call us at 215-657-2000 to verify if we accept your insurance. See the Abet Medical online catalog for a complete list of our products. Please contact us or visit our showroom and we’ll be happy to answer your questions.